One of The Best Sports Performances Tools Out There! Spend any time at our facility, and you will see athletes pushing around a piece of equipment that looks like a wheelbarrow without wheels. Some of our sleds even have a joke warning about nausea and indigestion called “prowler flu.” Jokes aside, this is an excellent piece of equipment for any athlete, and a staple for all our training programs for quite a few reasons - below are three. Athletes can build serious athletic qualities with the sled, and there is not a high risk of injury. 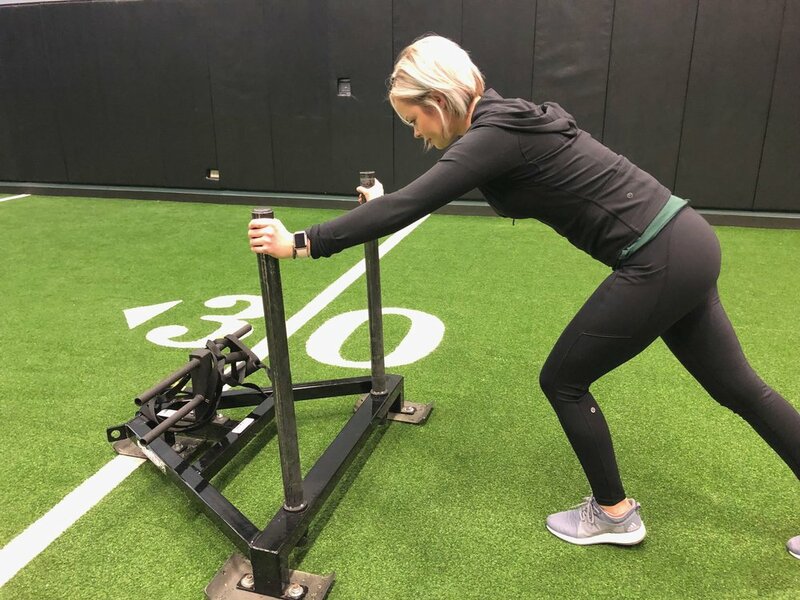 The sled is a low impact tool that builds lower body power, core strength, and adds a conditioning element while being easy on both the knees and the back. Touching on what we mentioned above, if we want to build power we have athletes push the sled fast. If we're going to work conditioning, we have the athletes push the sled over a longer course of time. If we want to we are working speed we can have the athletes push the sled with a deliberate focus of their limbs to emulate lower limb mechanics during sprinting. It does not take a lot of time to teach an athlete to push the sled, plus all the benefits, and this means we can get a lot done in workouts when we incorporate sled based exercises. One added measure, check out this video of the MLB National League MVP Christian Yelich, he is performing a lot of exercises we incorporate, including sled work (Click Here). Suffice to say, the sled is one of the best pieces of equipment we use and will remain a staple in our training programs for years to come. Christian Yelich goes HARD in the gym. Check out his offseason grind About Major League Baseball: Major League Baseball (MLB) is the most historic professional sports league in the United States and consists of 30 member clubs in the U.S. and Canada, representing the highest level of professional baseball.